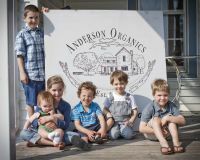 The roots of Anderson Organics date back to the late 1800's. The first Andersons in our family, Don's grandfather Alexander and his brother August, immigrated from Sweden to begin farming the fertile Midwest soil. 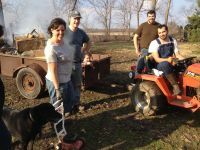 Settling into a small Northern Illinois community called Ridott, they established a diversified farm operation. The heritage of farming was passed down to Don's father, Howard, who continued the legacy through dairy farming and the management of an egg delivery route. Don, with his wife Vickie, continued the family farming practices by growing field corn with his brothers on the old homestead in Ridott. However, after many years of working in the insurance industry, while growing corn on the side, a strong desire for change began to stir in Don's mind. When he was suddenly laid off from his insurance job in January of 2009, new fields of opportunity suddenly came into view. Around that time, Philip and his wife Kelli came home to Rockford with their son, Elijah John, and a proposal for the entire family. They had been sensing a call to begin an organic farm that would provide access to healthy food while stewarding the land God had given. Philip's sister, Heidi, a pediatric ICU nurse, was the first to agree that this was the season to put their hands to the plow. Don and Vickie also felt convinced in their hearts and soon afterward a new chapter in Anderson farming began. At Anderson Organics, we have a passion for quality organic produce. We honor heritage and feel that the generations before us knew what they were doing when they worked the land. We give honor to them and the biodiversity they protected by utilizing as many heirloom seeds in our gardens as possible, as this reflects the creativity and glory of God. Above all, we honor God, who created the world and set the first family in a garden to tend and keep it. We, the Anderson Family, look forward to cultivating a long term relationship with you and your family, as we strive to bring you the freshest organic produce available.